Modern Stone Care has been providing the highest quality of floor maintenance and care to The Woodlands for several years. We specialize in natural stone flooring and tile and grout cleaning services. We offer floor cleaning, polishing, honing, sealing, and restorative services to our clients who want affordable quality. While we are open to servicing several different types of stones, flooring, counters, and in shower installations, we have a focus on Limestone, Granite, Travertine, Marble, and Slate materials. If you are in need of having your stone or tile and grout flooring services, contact us today! Having your natural stone floors polished is a necessity when it comes to getting them to sparkle and shine the way that natural stone flooring doee. A strong and consistent polish will keep your natural floors looking great. If your stone floors are beginning to look dull, or do not have a reflective sheen that catches the light, they are in need of a good polishing. How often you need to polish you natural stone flooring, depends on the traffic you have on your natural stone flooring. 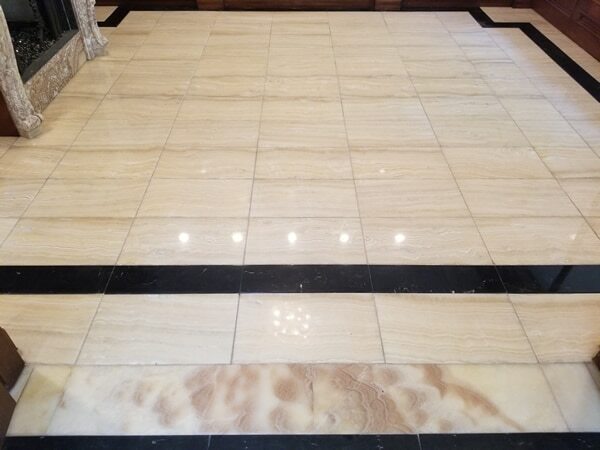 If you have natural stone flooring in a lobby where lots of people enter and exit, your floors will need to be polished much more frequently than say a marble floor in a three person household. Just as, a household with pets or children will most likely have more traffic and dirt tracked in, than an adult only household without pets. On average you will need to have your natural stone floors polished bi-annually to once a year. If you have gone longer than this, give us a call and we can set up an appointment to restore the gorgeous sheen your floors once had. We will be more than happy to explain all of the services we offer and answer any questions you may have.